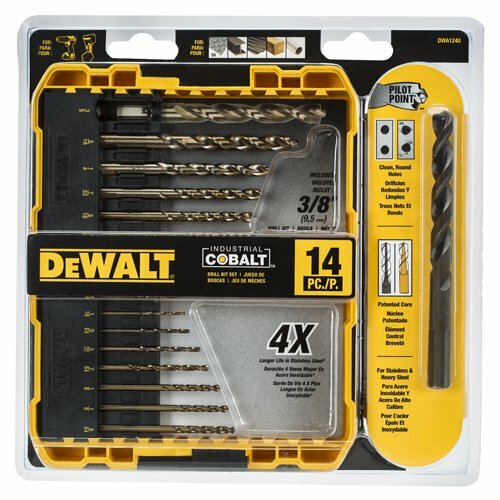 Save 1% on the DEWALT DWA1240 Pilot Point Industrial Cobalt Drill Bit Set (14 Piece) by DEWALT at In The National Interest. MPN: DWA1240. Hurry! Limited time offer. Offer valid only while supplies last. The DEWALT DWA1240 14pc Pilot Point Industrial Cobalt Drill Bit Set is designed for maximum speed and life in stainless steel and other hard metals. If you have any questions about this product by DEWALT, contact us by completing and submitting the form below. If you are looking for a specif part number, please include it with your message.